The IHBC Annual School is the principle platform for training and professional development for historic environment conservation specialists. It is the IHBC’s flagship national annual event drawing delegates from of IHBC members, non- member conservation professionals and the broader sector. The IHBC’s Annual School is the main event in the diary of conservation specialists from across the private and public sectors, and representing skills that range from archaeology, history, policy, legislation, financial management, and project management to design. Context, the journal of the IHBC, is a main source of record which will endure beyond the event. The Annual School edition of Context is made available freely to the public on the IHBC web site. The 2018 School can be seen in Context, the journal of the IHBC, at: https://ihbconline.co.uk/cont_arch/?p=1066 Alongside this material the web site also carries Annual School resources in perpetuity. 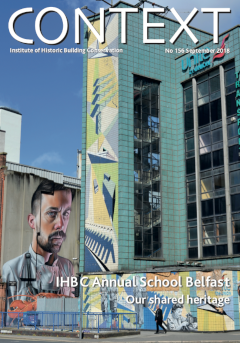 (https://www.ihbc.org.uk/belfast2018/) including programmes, speakers, presentations and feedback details ensuring that the key aspects of the School are available for open public reference and future research. This ensures the educational benefits of the School are available to all not simply IHBC members or those who attend. To ensure maximum delegate feedback delegates are directed within two days of the end of the School to an electronic survey form. This approach, first used in 2009, has proved to be very successful. It simplifies the process of submitting feedback for delegates, allows them to make any additional comments with ease and has been shown to deliver more responses than paper feedback forms. In recent years feedback from around 50% of delegates has been sought. Attendance at the Annual School over the past decade has been consistently good and in 2018 the School attracted 171 delegates (95 Day School and 76 Full School). Although the event is organised by the IHBC and is a key annual event for its members it provides training for non-members and all those with a professional interest in conservation. The Annual School continues to provide important training opportunities for those outside the Institute. In 2018 34.5% of the School delegates were not members of the IHBC, demonstrating the School’s wider appeal. 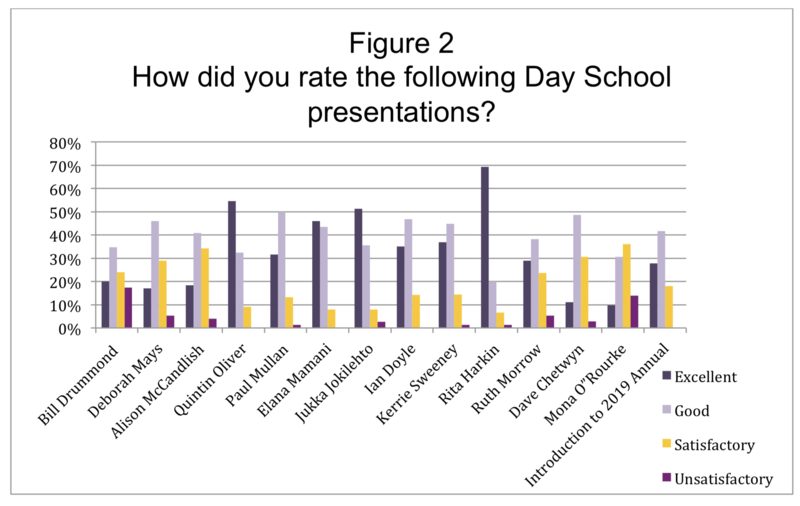 Delegates were asked to rate the Day School presentations and the results are shown in Figure 1, 87.01% of delegates found the Day School presentations to be Excellent or Good. A well organised, informative school. Good documentation, interesting speakers and plenty of time allowed for networking. The location and the variety of speakers was superb. Apart from specific comments on individual presentations the general comments made by delegates showed delegates found the talks useful and relevant. 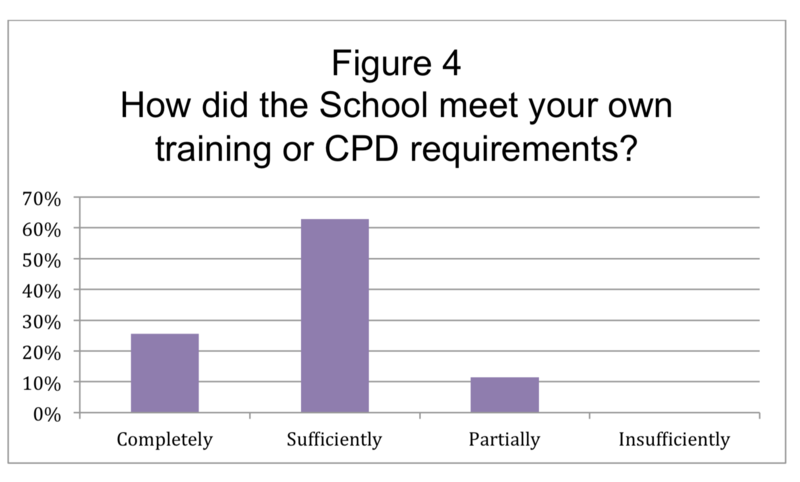 The generally high level of satisfaction is backed up further by the very encouraging data in figures 2 and 3 which reveals that 88.4% of delegates felt the School met their training requirements completely or sufficiently and that 98.72% felt the School was invaluable, very useful or useful. The School offered a series of study tours and visits on Thursday and Saturday. 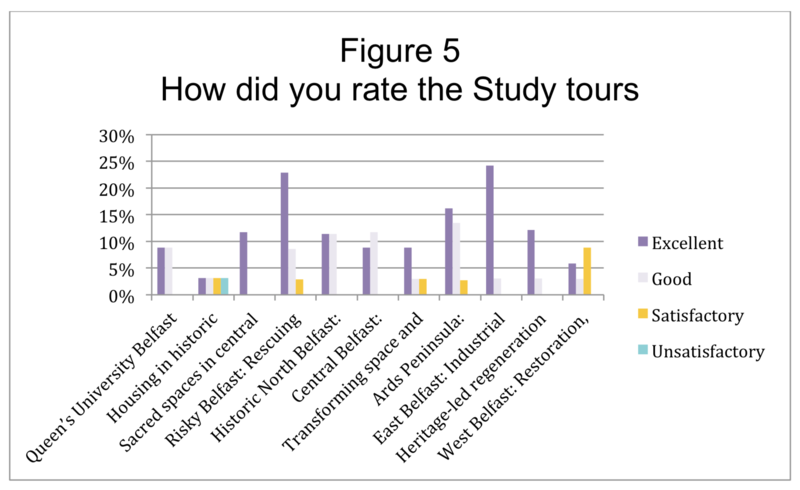 The tours received very high praise and the majority of delegates rated their tours as Excellent or Good (Figure 5). I was delighted by the mix of live site visit (building repair) and a wider regenerative scheme that my two tours encompassed. And we had fab weather! I was very happy with the tours I picked. The presenters were professional and informed. Beautiful scenery and superbly well organised. Amazed by the generosity of the leaders in terms of giving up a lot of their time and really sharing their knowledge. Incredibly interesting and worthwhile. 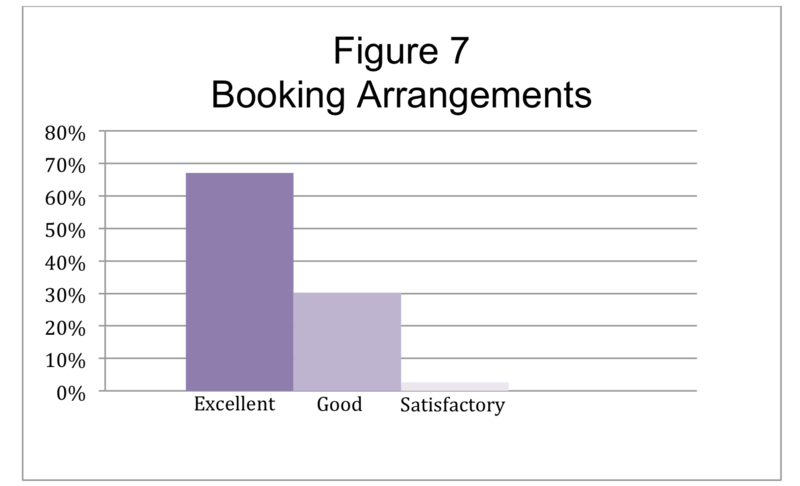 Delegates were asked to rate the organisation of the conference and the booking arrangements. 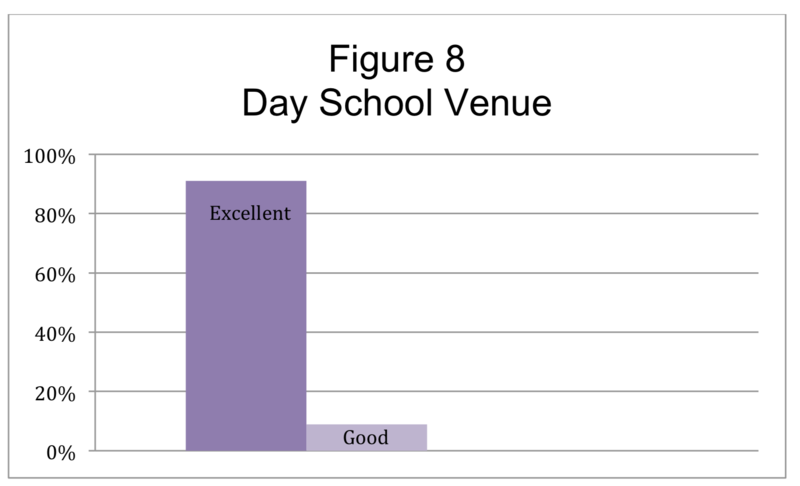 97.4% of delegates rated the organisation of the School as good or excellent (see figure 6). 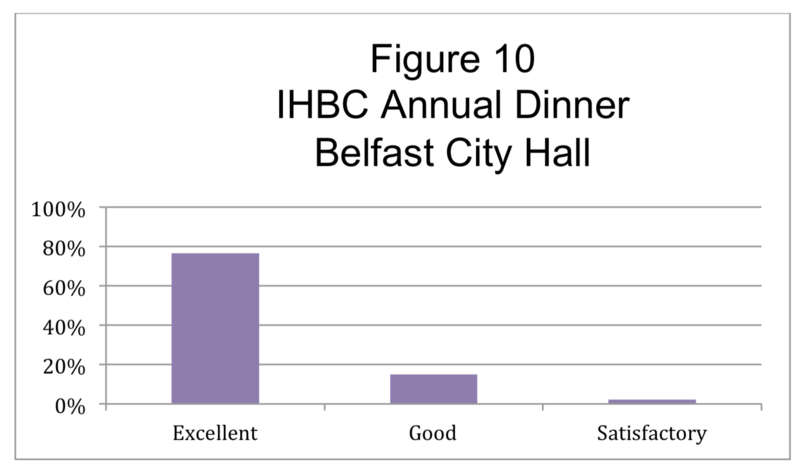 The Day School was held in the Ridell Hall, Queens University Belfast and delegates rated the venue well with 100% feeling it was a good or excellent venue and none feeling it to be unsatisfactory (see figure 8). The welcome Reception was held in the Great Hall of Queens University Belfast and 89.6% of those who attended felt it was Excellent or Good. Excellent venue, intro, and FOOD! Was very happy. Very good and plentiful food. Stunning hall (shame the wonderful sunshine also made half of us start to bake - not complaining though!) and generous food provision (thank you!). Such a lovely event to invite our corporate guests to. Thank you for all the wonderful team at the City Hall. SOOO good. Great venue. Loved the speakers and the presentations. The food was very elegant. Maybe one of the best annual dinners I've attended. Absolutely wonderful venue, staff were exceptionally helpful and attentive, and the food was lovely. Delegates rated the overall experience they had at the conference and its usefulness highly with 92.3% rating it as good or excellent. (See figure 12). Bringing the conference to a city which is rebuilding its image was a great idea, it gives us inspiration but also a feeling of contributing modestly to its economy and reputation. I hope more conferences will take place in the areas which are struggling and overcoming difficulties. Provided a 3-day course in Belfast in June 2018 of focused training for conservation professionals which include a series of different training methods including lectures, visits, networking etc. Provided the opportunity for delegates to obtain up to eighteen hours of Continuing Professional Development. Developed IHBC branch networks and volunteer capacity to a professional standard of training delivery. Reinforced the importance of the IHBC Annual School in the annual training calendar of conservation professionals. The IHBC’s Annual School has been operating successfully since before the foundation of the Institute in 1997, and is developed from the Schools pioneered by the Association of Conservation Officers and operated effectively each year since the mid 1980’s. The Annual School is the principle platform for training and professional development for historic environment conservation specialists. It is the IHBC’s flagship national annual event drawing from customer base of IHBC members, non-member conservation professionals and broad sector interests. The proceedings of 2018 Annual School have been described in some detail in Context the journal of the IHBC (Issue 156 September 2018) and this is a main source of record that will endure beyond the event. The Annual School edition of Context is made available freely to the public on the IHBC web site. Alongside this material the web site also carries Annual School resources in perpetuity (https://www.ihbc.org.uk/belfast2018/) including programmes, speakers presentations and feedback details ensuring that the key aspects of the School are available for open public reference and future research. The successful delivery of the 2018 School has reinforced the importance of the IHBC Annual School in the annual training calendar of conservation professionals and provided the opportunity for delegates to obtain quality, focused Continuing Professional Development.